With its bold band of color, this CAC R-4-BLK Rainbow 7.25 oz. 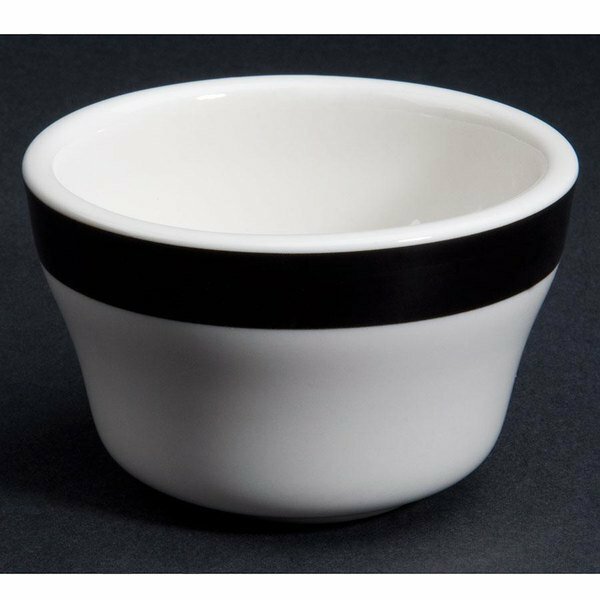 black rolled edge stoneware bouillon bowl adds a pop of color in any setting. Perfect for serving guests side orders of soup or chowder, this bowl is a versatile addition to your establishment. You can also use this bowl to serve fresh fruit at breakfast buffets. Ideal for cafes, diners, hotels, and catered events, this bowl is a great addition to your dinnerware collection. Featuring an attractive, bold black rim, this bowl creates an eye-catching place setting. The traditional rolled edge design also creates smooth edges for a professional presentation. Made of stoneware, this item is an economical, durable piece of dinnerware. Plus, it stands up against breakage, chipping, and scratches commonly caused by the wear and tear of every day use. As a part of the CAC Rainbow collection, you can mix and match plates, platters, and mugs for fun, festive table settings and serveware! Outstanding! Great size for a cup of soup. Fit perfectly on a tea cup saucer. We used to use tea cups for our cups of soup, these bullion bowls are about the same size and are much more classy. Took a little more delivery time than our other purchases, but after I emailed my need for quick delivery, I got them within a few days. Only problem is that they don't bounce when inadvertently dropped on the floor.